404 @ Tenbury - Durban Point Waterfront Accommodation. 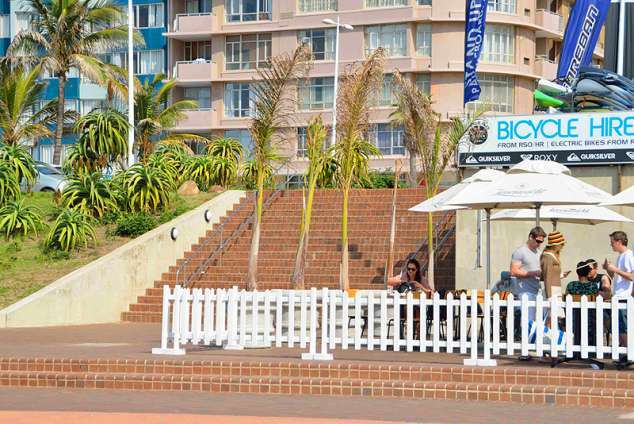 Located directly across from the uShaka beach (Blue Flag status), on the 4th floor, our apartment has uninterrupted ocean views, along with stunning views of the promenade, and Durban coastal skyline; a brilliant setting to allow you and your family to really bask in the Durban ambience. All facilities at our apartment are with the view of making you most comfortable. Furnished and decorated with a modern eclectic taste, our very spacious one bedroom, one bathroom, apartment is air-conditioned, and finished with only the highest quality of finishes. This involves granite kitchen work tops, mahogany headboards, flat screen TV’s and a DSTV compact package. The apartment sleeps a maximum of 5, with the addition of a modern sleeper couch. Our fully fitted, and kitted, kitchen (and adjoining dining area) is stocked with all your required cooking accoutrements, and all major appliances (including dishwasher and washing machine); allowing you and your family to enjoy all creature comforts. Our apartment also boasts a dedicated study area, providing the business traveller a most convenient place to catch up on some work. 22139 page views since 04 Jul, 2016.